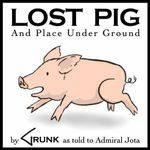 Lost Pig is a text adventure game (also known as "Interactive Fiction") about an orc named Grunk and a pig who would much prefer to remain lost. The story is told entirely from Grunk's perspective, in his own words (just words no pictures), so the player gets to experience the world through Grunk's unique point of view. It's entirely up to you to figure out how he's going to find that pig and get it back home. Along the way, you'll get to discover a lost underground shrine, solve a few puzzles, practice your conversational skills, and maybe even learn a thing or two about alchemy. So enjoy the ride! - "Grunk need find pig"